The CARMEN Neural Network Controllers contain a special code, which cooperates tightly with the CARMEN ANPR engine during the automatic number plate recognition process. All CARMEN Neural Network Controllers run a special neural network code of the license plate recognition process. The main parts of the license plate recognition process run on the CPU of the PC, but some functions of the code are outsourced to the microcontroller, so the presence of the CARMEN Neural Network Controller is indispensable during image processing. The CARMEN FXMC USB Neural Network Controller is a non-transparent Neural Network Controller that can be connected to the USB port of a computer. By using this device, there is no need to any free PCI slots, neither to any PC104+ layers. The operating system has to support USB though. When using CARMEN FXMC USB - excepting the image capturing process - you can have the same possibilities and features as with the CARMEN FxVd4mc_s grabber card, and moreover you have the chance to use your own video capture card. Internal device, which can be connected directly to the motherboard through the 4 pin vertical USB connector (Samtec SSM-102). In order to fix the device, two spacer bolts and two pieces of M3 screw is needed. Ideal for system integrators as being an internal device, it protects the HW key from being stolen or physical damage. Available with: CARMEN FreeFlow, Parking Digital and ACCR license. The CARMEN FXMC Express Neural Network Controller has an ExpressCard 34 interface. The controller can be inserted into a free ExpressCard (34/54) slot available in most today's notebook models. This version is ideal for mobile devices since most of the NNC card is fully or largely hidden within the PC housing. In this case the NNC controller is in safe and there is less risk to steal or harm the unit. The high speed ExpressCard connector provides real fast response time. The device allows usage of CARMEN ANPR on Windows and Linux platform. The CARMEN FXMC PCIe Neural Network Controller has a PCIe x1 interface, so that the controller can be inserted into a free PCIe slot of a PC. 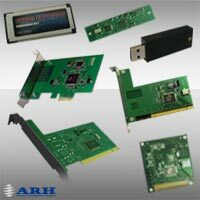 The high speed PCIe interface provides exceptionally fast response time. This Neural Network Controller is available with Single, Dual (2-core), or Quad (4-core) FreeFlow Licenses. The CARMEN FXMC PCI Neural Network Controller has a PCI interface, so that the controller can be inserted into a free PCI slot of a PC. The high speed PCI connector provides real fast response time. When using CARMEN FXMC PCI - excepting the image capturing process - you can have the same possibilities and features as with the CARMEN FxVd4mc_s PCI grabber card, and moreover you have the chance to use your own video capture card. The CARMEN FXMC PC104+ Neural Network Controller has a PC104+ interface, so that the controller can be added to a PC104+ layer of a PC104+ format computer. The high speed PC104+ interface also provides real fast response time. When using CARMEN FXMC PC104+ - excepting the image capturing process - you can have the same possibilities and features as with the CARMEN FXVD4mc_s PC104+ grabber card, and moreover you have the chance to use your own video capture card.